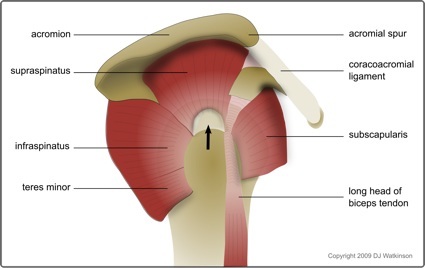 When the rotator cuff tears, it usually pulls away from the bone in a degenerate part of the tendon. This most commonly affects the supraspinatus tendon. The challenge for the surgeon is to not only obtain a strong repair during the operation, but also to ensure that the degenerate rotator cuff tendon heals securely back onto the bone. The larger the tear and the more degenerate and weak the tendon, the harder it is to achieve this. Rotator cuff repair surgery was traditionally performed through a large incision as an open operation. 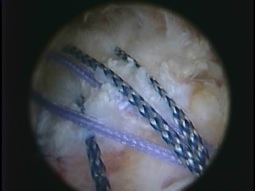 With the introduction of arthroscopic shoulder surgery, surgeons moved on to the so called mini-open cuff repair. This starts as an arthroscopy to prepare the tendon and remove any bony spurs, but the actual repair is still performed as an open operation. The incision is nevertheless smaller than is required for a traditional open repair. 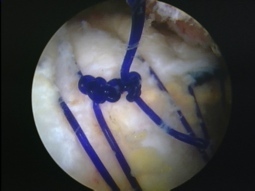 With modern arthroscopic techniques, it is now possible to perform the whole repair arthroscopically through 4 or 5 very small incisions (about 10mm each). This offers the usual potential benefits of keyhole surgery including less pain, less scars (both externally and internally), and more rapid rehabilitation. Arthroscopic rotator cuff repair is usually performed under a general anaesthetic (you will be asleep) combined with a regional nerve block. The latter involves an injection of local anaesthetic around the nerves to the arm just above the shoulder. The aim is to minimise postoperative pain by numbing the area for 12 to 24 hours. However it is important to start taking pain-killers before the nerve block wears off. Your anaesthetist will discuss all of this with you before the operation. What does the actual operation involve? The surgery usually takes 40 to 90 minutes depending on the size and complexity of the tear. The operation is performed through four or five very small incisions (about 10mm each). It begins with an arthroscopic subacromial decompression, in order to create more room for the repaired tendon in the subacromial space. The edge of the tendon and the bone at its insertion site are then freshened in order to stimulate healing. Finally sutures (stitches) are placed in the tendon and fixed to special anchors secured in the bone laterally. As the suture is tightened, the tendon is brought back and held firmly against its bony insertion. Once you are awake, you will be transferred back to the ward. Your arm will be in a sling in order to protect the tendon repair (see below). The ward physiotherapist will show you how to take this on and off safely. They will also teach you some very gentle passive exercises which should be performed out of the sling three times a day. However you should wear the sling at all other times including at night. As mentioned above, it is a good idea to start taking pain killers before the block starts to wear off. Some patients prefer to stay in hospital overnight, but the operation can be performed as a day-case. For how long do I need to wear the sling? You will generally need a sling for two to four weeks (occasionally up to six for very large tears). This is very important as the repair needs to be protected in the early stages of healing. If you do too much too soon there is a risk that the sutures will pull out of the tendon or snap, resulting in failure of the cuff repair. The security of the repair depends mainly on the quality of the tendon and the size of the tear. Your surgeon will be able to advise you on this and your physio will tailor the speed of your rehabilitation program accordingly. What happens after 2 to 4 weeks when the sling comes off? This is when your physiotherapy starts in earnest. Your shoulder will be stiff after the period of immobilisation and initially the physiotherapist will concentrate on recovering your range of movement. They will gradually introduce strengthening exercises as movement returns. Please bear in mind that although the tendon should be starting to heal at this early stage, it usually takes four to six months for the repair to reach maximum strength. How quickly can I start using the arm? This will be governed by the strength of the repair as discussed above. In general you should avoid lifting anything heavier than a mug of tea until the three month mark. After that you can gradually increase loads, but you should avoid any heavy activities or sudden impacts until four to six months. Legally, you need to be able to drive in full control of your vehicle. Generally this means two to four weeks after coming out of the sling. It is obviously a good idea to start with short distances and gradually build up. This very much depends on the nature of your work. If your work is office-based and you are able to get to work and do your job with your arm in a sling, then you you can go back two to four weeks after your cuff repair. However I would normally recommend a minimum of six to eight weeks off. You also need to be careful about going back to work just after coming out of the sling as the shoulder is particularly vulnerable at that point. If your job is more physical, you will normally need three months off and then a further one to three months on light duties. If you are self-employed then some compromise is possible, but an earlier return to heavy work increases the risk of failure of the repair. How soon can I go back to sport? The majority of sports should be avoided until at least four months after the repair. Nine to twelve months is more realistic for contact or overhead sports. Please discuss specifics with your surgeon. Cardiovascular fitness can be maintained with gentle running or the use of a reclined static bike from around the eight week stage. However please bear in mind that sprinting or pulling on the handlebars of a bike may place an excessive strain on the rotator cuff repair. Any return to sport should be gradual. If you discuss this with your physiotherapist, they will design an appropriate rehabilitation program. As with any operation, there is a small chance of infection, nerve damage, or bleeding. However with keyhole surgery this risk is very small. 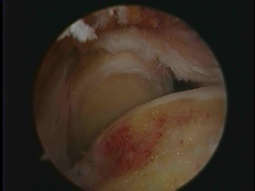 The two main risks of rotator cuff repair surgery are stiffness and retear. Some degree of stiffness is inevitable, even with an arthroscopic repair. This is due to the combination of an operation with a period of immobilisation. 70 to 80% of normal movement is usually recovered after a couple of months of physio out of the sling. However it may take six to twelve months to regain a full range of movement. 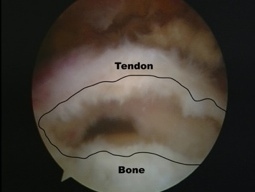 As with any surgical repair, there is a risk that the tendon will fail to heal or retear. The risk of this happenening is related to the size of the tear and the quality of the tendon. The two are linked as larger tears usually occur in more degenerate tendons (more friable and less healing potential). The risk is relatively low in small to medium sized tears, but studies have shown retear rates of 50% or more in very large degenerate tears. Posted in Rotator cuff problems, Shoulder Problems, Shoulder Surgery.